Tracking Election Coverage: September 11-24 : NPR Public Editor Candidate coverage evened out a bit in the past two weeks. 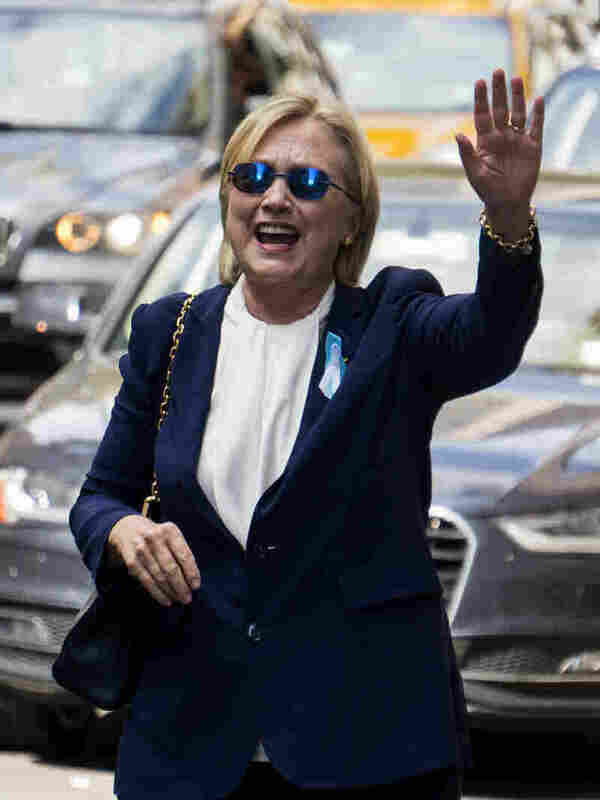 Democratic presidential candidate Hillary Clinton waves as she walks from her daughter's apartment building Sept. 11, 2016, in New York. Clinton unexpectedly left the 9/11 anniversary ceremony. Her campaign later announced she had been diagnosed with pneumonia. My office is tracking NPR's candidate coverage, online and on its morning and evening newsmagazines, in response to requests from listeners. From Sept. 11 through Sept. 24, there were 42 stories focused primarily on Republican presidential candidate Donald Trump, compared with 34 stories focused mostly on Democratic presidential candidate Hillary Clinton. Libertarian candidate Gary Johnson was the main focus of one story during that period. Another 65 stories — or almost half of NPR's campaign coverage — looked at more than one candidate, or general election issues. Clinton's pneumonia disclosure was the highlight of the first week of this tracking period, accounting for more than half of NPR's coverage of the candidate during the week. It was the first week (excluding convention coverage) since mid-June, when this office began tracking the newsroom's election reporting, that Clinton received more individualized coverage than her Republican opponent. My office continues to hear from listeners about the perceived tone of the stories about both candidates, and the amount of time devoted to each of them. Linda Katz of Philadelphia, Pa., wrote with a specific concern about the amount of time afforded to covering Trump in NPR's newscasts. My office is not tracking the newscasts, but Mark Memmott, NPR's standards editor, did examine the week from Sept. 11 to Sept. 17 (the week of Clinton's pneumonia disclosure). He found that the newscast coverage was fairly even. Of about 220 newscasts in that period, 53 contained a story about Clinton and not Trump, and 51 contained a story about Trump and not Clinton. A Clinton-centric story preceded a Trump-centric story in 49 of the newscasts, while a Trump-centric story preceded a Clinton-centric story in 44 newscasts. In 22 newscasts, a story about both candidates was either the only campaign story or preceded another about one of them. Expressions of concern about the lack of coverage of the third-party candidates continue to come in. In addition to the single Johnson-focused piece — which ran in the week before the Debate Commission announced that he and Green Party candidate Jill Stein had not qualified for the debates — the two candidates were mentioned a few times in general election coverage. Independent conservative candidate Evan McMullin was mentioned in one general election article. Mick Hannaway of Pasadena, Calif., wrote: "This is getting unbearable! Stop focusing on 2 presidential candidates. Gary Johnson and Jill Stein are running too. ... When there is an 'issues story', I'm begging you please to put the Libertarian and Green Party candidate into the issue." Listeners and readers who have been asking for more issues-focused pieces were well served last week, thanks, in part, to the latest series of A Nation Engaged reports. To single out a few, there were stories about Trump's tax plan, and the candidates' differing views on homegrown terrorism, combating rising crime rates (also here), boosting American economic mobility (also here and here) and energy policy. The previous week also included four platform pieces, looking at how the candidates approach the Afghan War, taxes, helping veterans and family policies. Finally, I'd call attention to this guide to tonight's debate that tackled the issues in depth. And for those who are looking for real-time debate fact checking, NPR is planning something new online. Several NPR correspondents will be annotating a transcript of the debate as it happens at NPR.org. More details on NPR's debate plans can be found in this press release. Intern Anna Mazarakis and editorial researcher Annie Johnson contributed to this report.